May 26, 2013 – Masked Mosaic: Canadian Super Stories Reading & Discussion …Claude Lalumière and fellow authors Camille Alexa, Lisa Poh, Marie Bilodeau, and Patrick T. Goddard will be on hand to read excerpts and discuss their stories in the new Tyche Books collection: MASKED MOSAIC: CANADIAN SUPER STORIES. 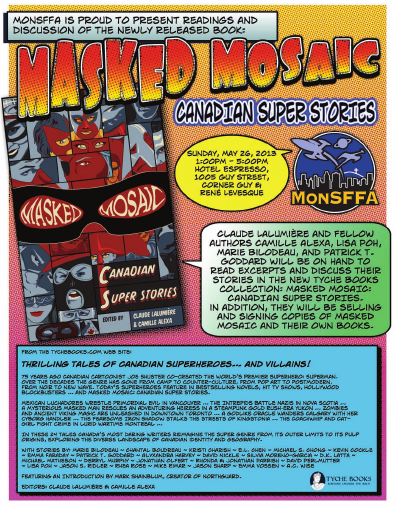 In addition, they will be selling and signing copies of MASKED MOSAIC and their own books. They even made an amazingly nifty poster. Please do come say hello.